I don’t know if I’ve ever mentioned in any previous post, that Chloe would be the one to give me the biggest fight. Well, truer words were never spoken. Slowly but surely, I’ve been trying to eliminate certain foods & ingredients out of the house. If its out of the house, its out of their mouths, or so me thinks! I was snooping looking through her book bag the other day and came across contraband. There was a juice box and a bag of potato chips. Now don’t get me wrong. I know they’re children and they’re going to want to eat what their friends eat. I understand that. I only ask that we do it once a week. Preferably on the weekend, & we choose together what said snack will be. But, oh no, that wasn’t good enough for little miss Chloe. So this morning, breakfast was supposed to be 1 banana & 1 glass of water to start the day. Then 1 sausage link & 1 waffle. Banana & water. Check. Sausage & WAFFLES. Check……Check? WAFFLES with an S! As in more than 1! What???? ME: Chloe, you’re not eating two waffles. CHLOE: Why not???? Why Not????? Never in ten trillion years, could I have even thought to ask my mother, WHY NOT!!!………. I would still have been picking up my teeth! This is going to be harder than I thought!! Needless to say, She didn’t eat the two waffles. We both left the house pissed off!!! For dinner there was a field greens salad with an extra small portion of Ziti. The Ziti was made with lean ground turkey, part skim mozzarella, part skim ricotta and……….CHOPPED SPINACH!!! No fighting, No argument, No fuss. *Please notice that dinner is served on small dishes. 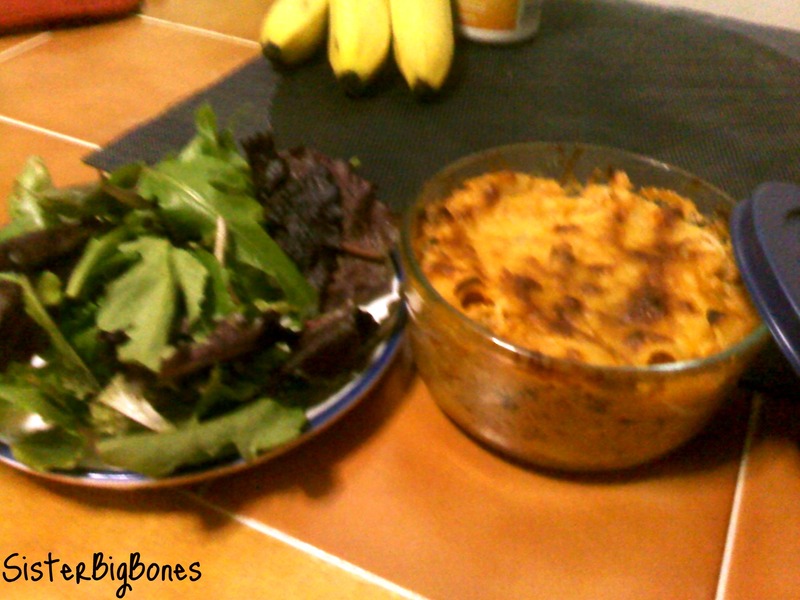 The salad is on a saucer and the Ziti is in a small Pyrex dish. I’m hoping to make baked eggs for tomorrows breakfast. Wish me us luck!